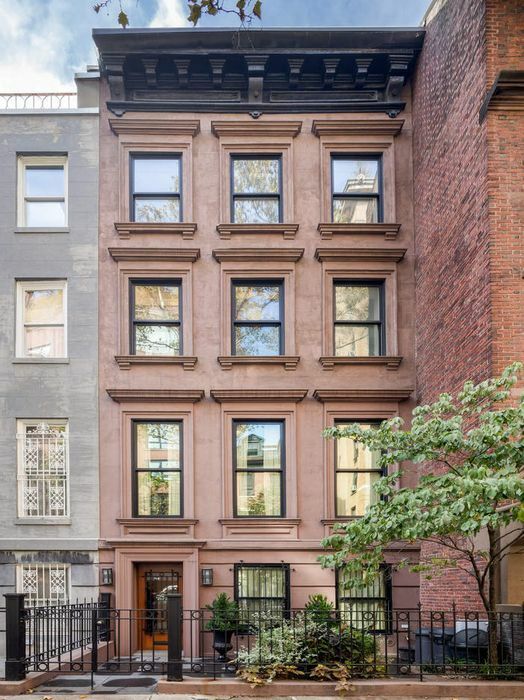 154 East 74th Street, New York, NY 10021 | Sotheby's International Realty, Inc.
$9,749,000 4 Bedrooms4 Full / 1 Partial Baths4,275 sq. ft. 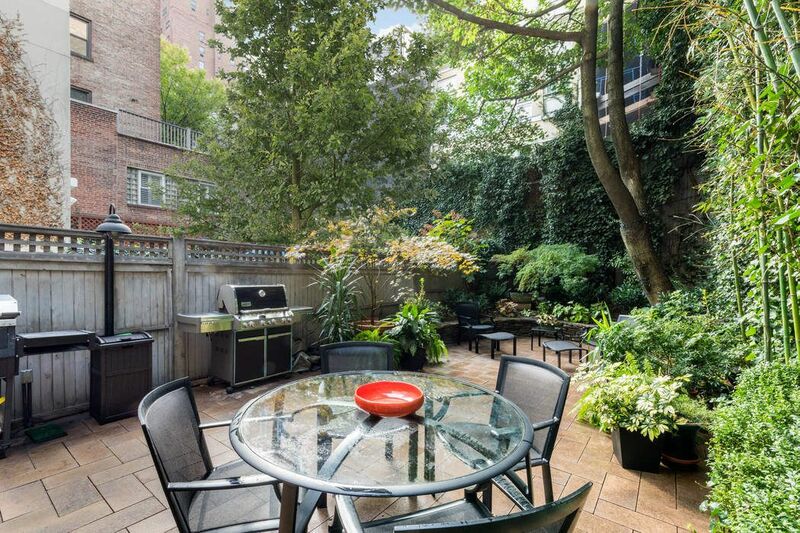 Behind the gate at 154 East 74th Street awaits a home that is cheerful and relaxed. On the first level you will find a bedroom / den, a full bathroom, and a generous media room with a gas fireplace, and adjoining wet bar. With French doors leading to the lush private garden lined with greenery, this area makes the ground floor the perfect spot for entertaining. The south facing garden is large enough for multiple seating areas and is fully enclosed by tall fencing and mature trees allowing for total privacy. 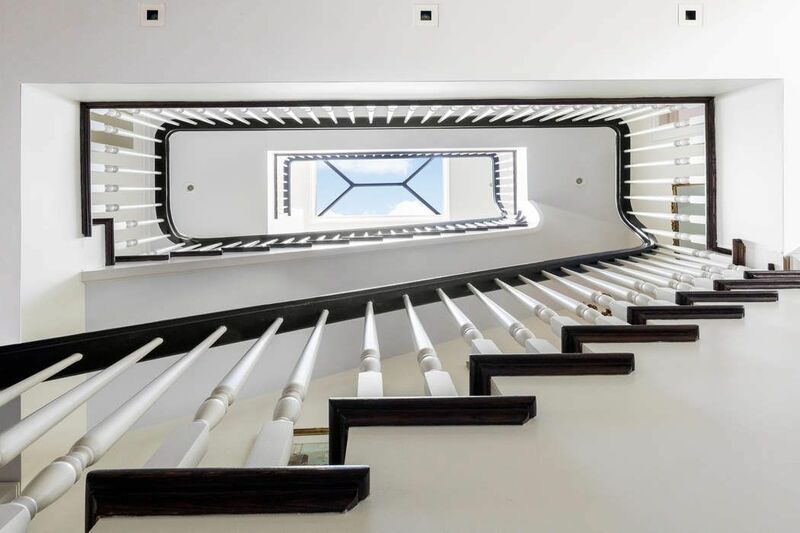 Ascend to the second level to find the main living area of the home. 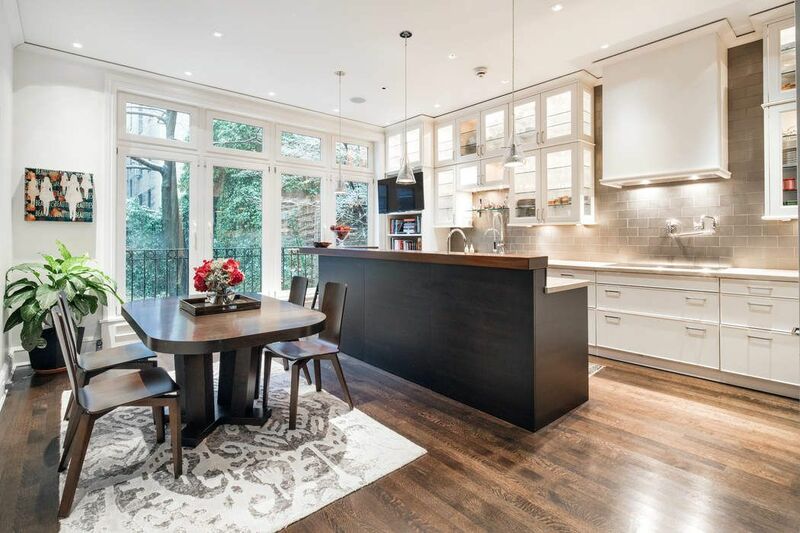 The open eat-in kitchen has been designed with custom cabinetry and refrigeration system as well as two sinks, a sleek induction cook-top, Gaggenau oven, and large center island. 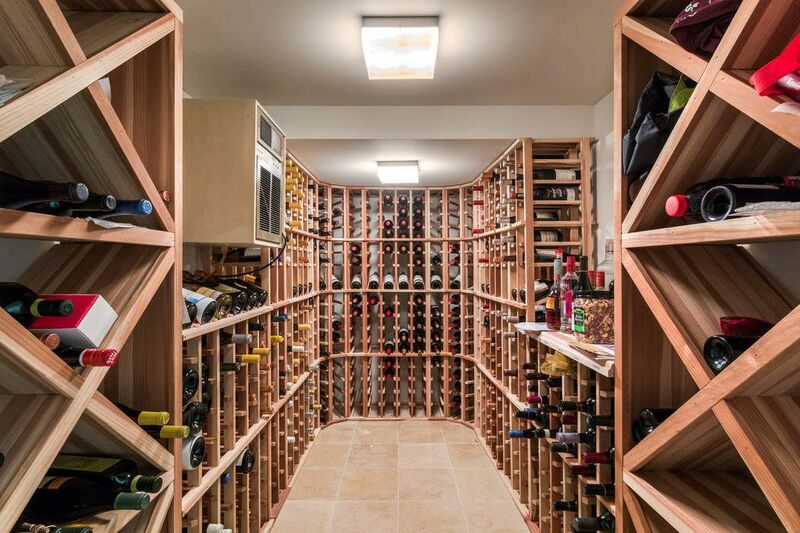 This kitchen is functional when cooking for one or one dozen. The large dining area and four floor to ceiling windows overlooking the garden make this room comfortable and sunny. 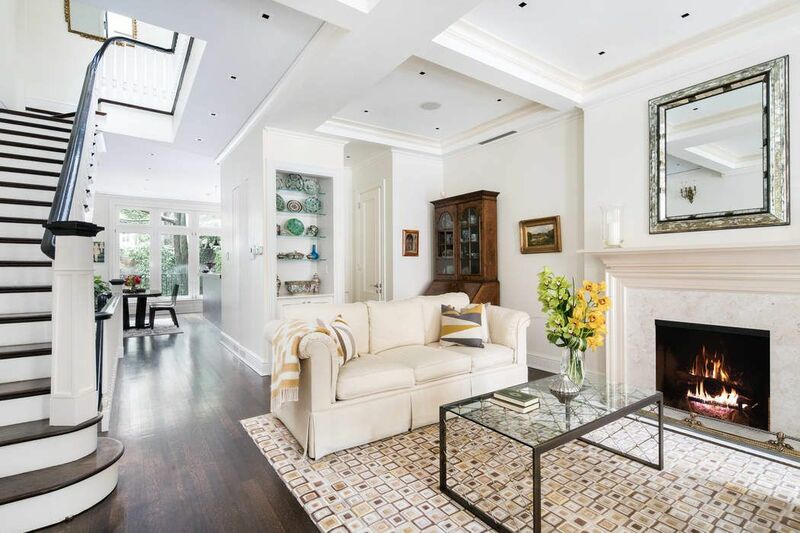 Down the hall, the living room is the most formal of rooms in this otherwise casual home. It is large enough to fit a grand piano with a spacious seating area surrounding the wood burning fireplace and adjacent powder room. 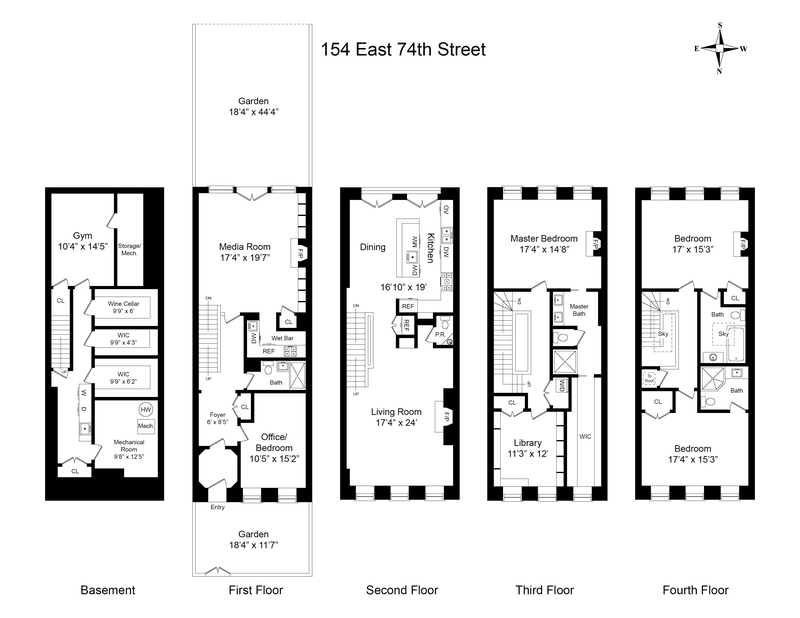 The entire third level is devoted to the master suite which includes a library with built in book shelves, a spacious master bedroom, and bathroom equipped with a heated marble floor, Jack-and-Jill sink, custom stalled shower area and a large walk-in closet. This floor also offers the convenient second washer / dryer. Two bedrooms, both with en-suite baths are located on the fourth level. Here you will find the home’s fourth fireplace in one bedroom and an exposed brick wall in the other. The massive skylight welcomes light that carries from this floor to all of the levels below. 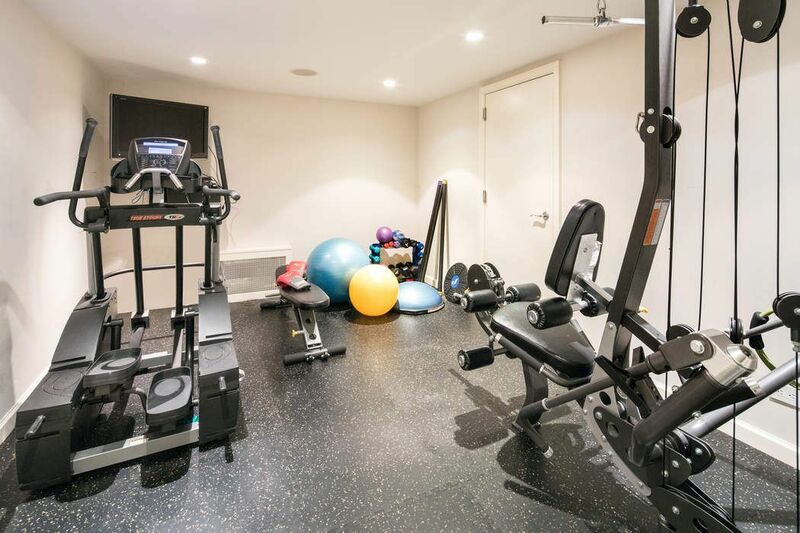 The finished basement features impressive amenities including a large laundry area, ample storage space, a wine cellar, and a gym. This home is fully renovated ready for a quick and effortless move in. 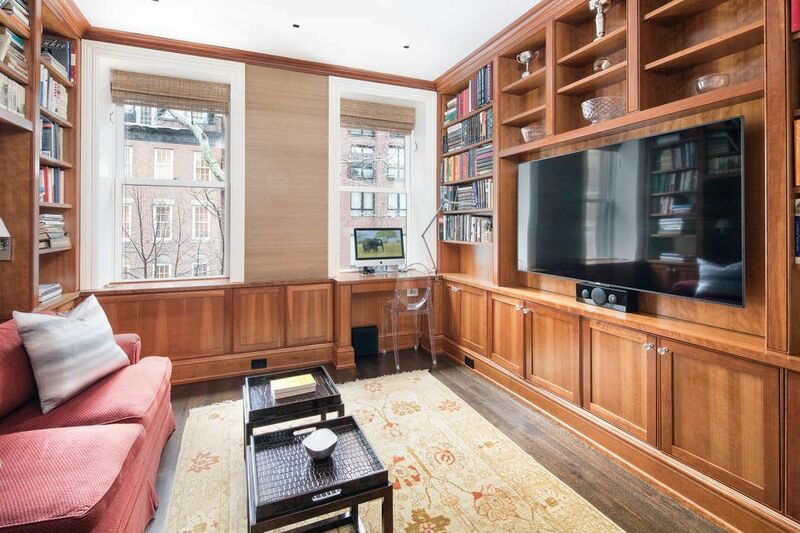 Behind the gate at 154 East 74th Street awaits a home that is cheerful and relaxed.On the first level you will find a bedroom / den, a full bathroom, and a generous media room with a gas fireplace, and adjoining wet bar. With French doors leading to the lush private garden lined with greenery, this area makes the ground floor the perfect spot for entertaining. 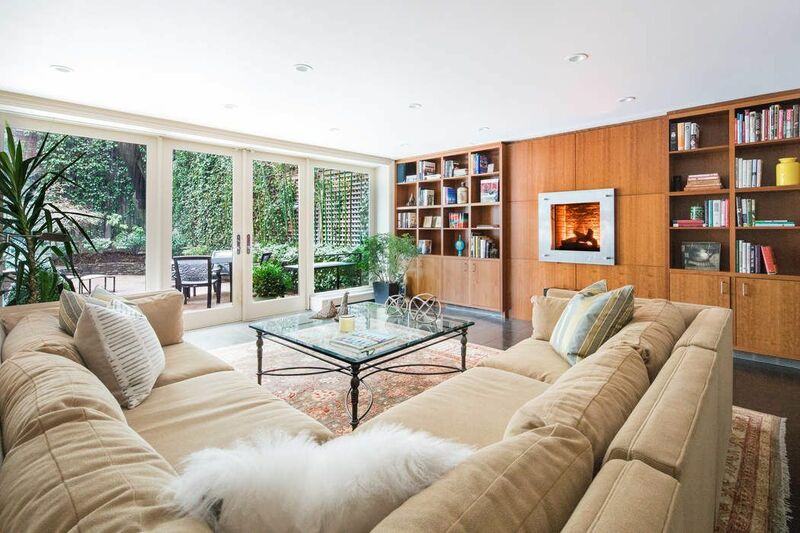 The south facing garden is large enough for multiple seating areas and is fully enclosed by tall fencing and mature trees allowing for total privacy.Ascend to the second level to find the main living area of the home. 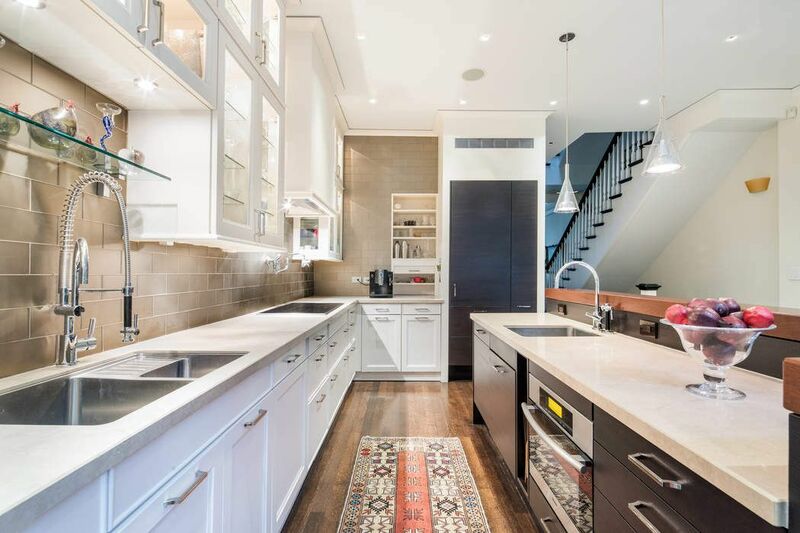 The open eat-in kitchen has been designed with custom cabinetry and refrigeration system as well as two sinks, a sleek induction cook-top, Gaggenau oven, and large center island. This kitchen is functional when cooking for one or one dozen. The large dining area and four floor to ceiling windows overlooking the garden make this room comfortable and sunny.Down the hall, the living room is the most formal of rooms in this otherwise casual home. It is large enough to fit a grand piano with a spacious seating area surrounding the wood burning fireplace and adjacent powder room.The entire third level is devoted to the master suite which includes a library with built in book shelves, a spacious master bedroom, and bathroom equipped with a heated marble floor, Jack-and-Jill sink, custom stalled shower area and a large walk-in closet. This floor also offers the convenient second washer / dryer.Two bedrooms, both with en-suite baths are located on the fourth level. 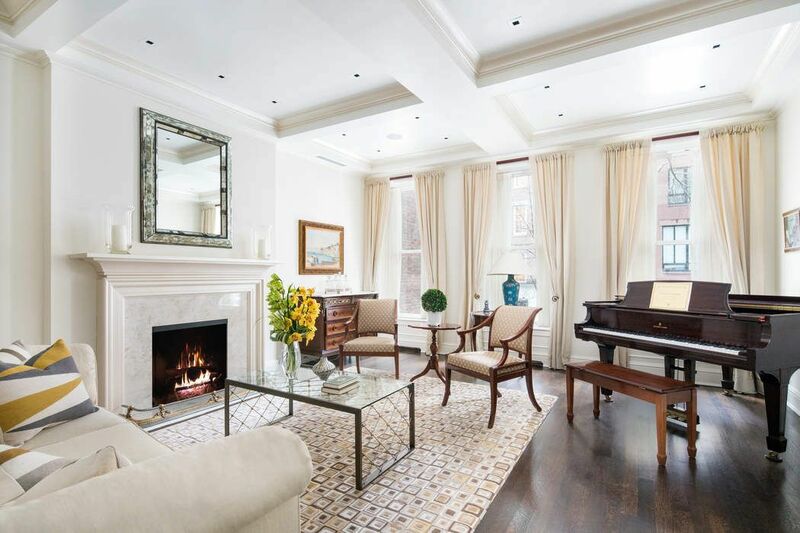 Here you will find the home’s fourth fireplace in one bedroom and an exposed brick wall in the other. The massive skylight welcomes light that carries from this floor to all of the levels below.